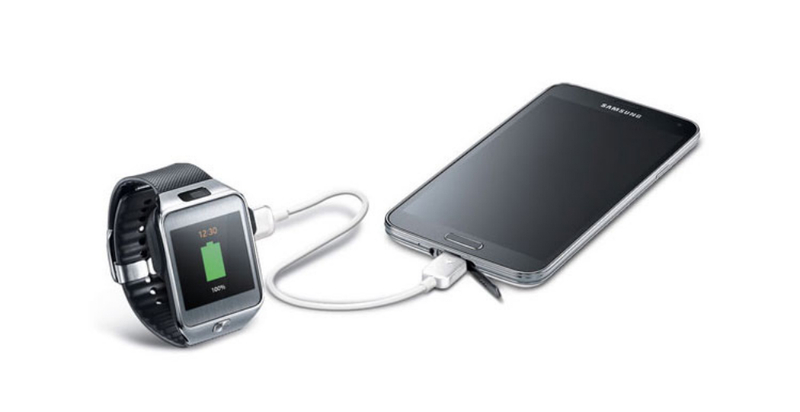 Battery life is not exactly a strong suit of smartwatches currently on the market. Their limited power capacity can be especially problematic if you find yourself away from a charger for more than a day or longer. While devices with longer-lasting battery tech will take a bit more R&D, Samsung has developed a solution in the interim – the Power Sharing cable. As the name implies, the Power Sharing cable lets you siphon juice from a smartphone to charge a peripheral gadget, like a smartwatch. Lest you worry about your smartphone’s battery, the amount of transferred power is customizable via the accompanying Power Sharing app which is downloadable through Google Play. The cord retails for $19.99, and is capable of charging any micro USB device. Officially, you will need one of the supported Samsung Galaxy devices – the Galaxy S 5, Galaxy Tab S 10.5, Galaxy Tab S 8.4, Galaxy Alpha, Galaxy Avant, or Galaxy Note – to use the requisite Power Sharing app, at least until intrepid developers port it to other devices (no guarantees).